The artifact I found was a poster advertising for a folk and blues music festival that took place on January 26th of 1952. This happened during what we now refer to as the American folk music revival. The festival took place at a concert hall called Loew’s Sheridan, located in Greenwich Village in New York City. The location of this event is significant. Many artists central to the Beat Generation, an important American literary movement, lived in Greenwich Village in the 50s and 60s. As the Beat movement expanded, other counter cultural movements, such as Hippies, adopted similar mentalities. Greenwich Village later became a major hub for folk musicians during the 60s, where many major acts got started in the music club scene. 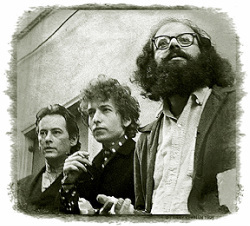 Fun Fact: The Greenwich Village folk music scene in the 60s is the primary subject of the Cohen Brother’s film, Inside Llewyn Davis. The festival contained an unbelievable lineup, containing some of the most important musicians to the folk revival movement. Included were Woody Guthrie, Leadbelly, Pete Seeger, Sonny Terry, and Brownie McGhee. 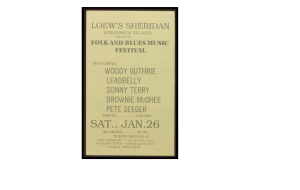 “Guthrie, Woody with Leadbelly, Sonny Terry, Brownie McGhee, and Pete Seeger at Loew’s Sheridan, New York, New York.” Http://www.amdigital.co.uk/. Accessed October 16, 2017. http://www.rockandroll.amdigital.co.uk.ezproxy.stolaf.edu/Search/DocumentDetailsSearch.aspx?documentid=1065366&prevPos=1065366&vpath=searchresults&pi=1.